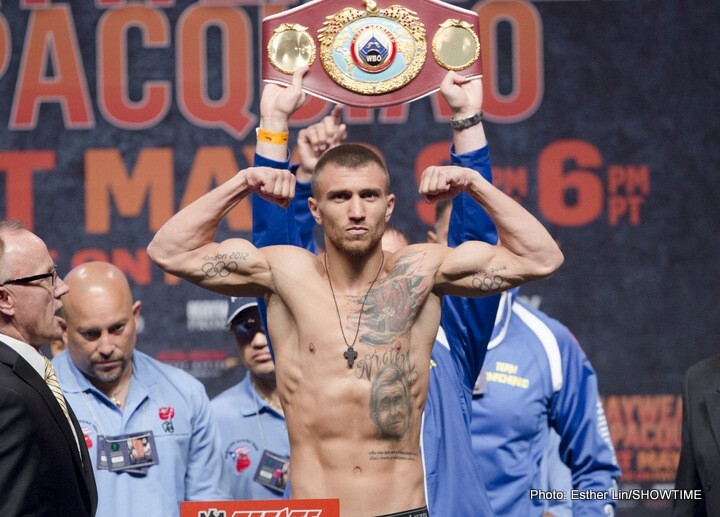 Vasyl Lomachenko: has any other 6-1 fighter ever looked so great! Due to his stunning and brutal KO win over the more than capable Roman “Rocky” Martinez, Ukraine’s Vasyl Lomachenko is currently getting all kinds of praise from many people. An amazing amateur talent – wining, amongst other top honours, two gold medals at Olympic level – the 28-year-old southpaw looks set to match his unpaid success in the pro ranks; if that’s possible – 396-1, a truly staggering set of numbers, makes up Lomachenko’s amateur record, after all. At just 6-1(4) Lomachenko has already engaged in six world title fights (WBO) and the man known as “Hi-Tech” has captured two major belts. It is the crushing win over Martinez – 29-2-3 coming in and stopped just once prior to this past Saturday – that really has people excited, though. Promoter Bob Arum has a genuine, the sky’s-the-limit feeling/belief with the WBO 130-pound boss, and he has dared a number of fine fighters to accept a date with his latest jewel. One man fans would be very interested in seeing Lomachenko fight is the only man to have beaten him as a pro: ultra-tough, never-in-a-bad-fight Mexican Orlando Salido. Salido thwarted Lomachenko’s attempts at becoming a world champ in just his second fight, when he used his savvy and his tricks to closely out-point him back in March of 2014. The SD loss, not so much a setback, more a source of further motivation, was followed by Lomachenko wins over such talent as Gary Russell Junior (then 24-0), Chonlatarn Piriyapinyo (then 52-1) and last time out Martinez. Fans are now asking themselves, whenever has a 6-1 fighter been so filled with such promise, so superbly gifted and so all set up for true stardom? Lomachenko could be boxing’s next big thing, all he needs is the top-level opposition to prove it. Arum has said it will likely take “a lot of money to get good fighters in the ring with him,” in speaking about his new star, and we fans hope this cash will be found and then parted with. Great match-ups such as Lomachenko-Salido II, Lomachenko-Nicholas Walters and Lomachenko-Felix Verdejo (in what could be a huge return meeting of the amateur bout these two superb boxers engaged in) would prove to make a large amount of money well worth spent. Many people have asked who the sport’s next superstar might be now that Floyd Mayweather is retired. He might have already arrived. Previous boxing news: Invaluable site BoxRec’s new ratings: the pound-for-pound best of all-time! You are here: Home / Boxing News / Vasyl Lomachenko: has any other 6-1 fighter ever looked so great!